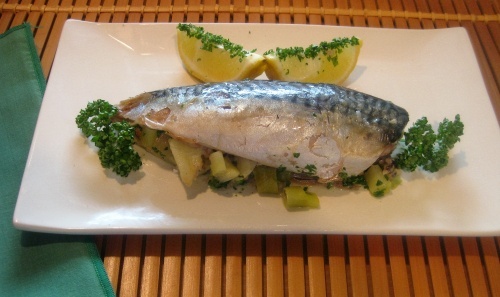 Mackerel are a good source of Omega 3 and have an excellent flavour. Because they are oily fish they benefit from being accompanied by a slightly acidic food, such as the traditional gooseberry sauce or as here with apples. They are an easy fish to prepare; the fishmonger will slit it and remove the inside and also the head if you ask. You will need some kitchen foil in which to bake them. Prepare the fish. Cut off the head and tail. Slit the belly completely at the tail end, open flat and remove the bone by lifting it by the head end and pulling downwards. Remove any small side bones by running the fingers down the fish from head to tail and pulling out the thin bones. Take half the apple, peel and remove the core then cut into thin slices. Trim the spring onions and chop them (white part only). Mix with the bread crumbs, the grated zest of the ½ lemon with 2 tbsp of juice. Add the chopped parsley and season with salt and pepper. Heat the oven to Gas 4 / 180C. Have ready a piece of foil for each fish a little longer than the fish and wide enough to wrap around. Grease with oil. Fill the fish with the stuffing, fold over to contain it. Place in the middle of the squares of the foil and bring up the sides to seal. Put onto a baking tray and bake 20-30 minutes until cooked (open one to check). Remove from the foil and serve with wedges of lemon. Crusty bread and a green salad are good to serve with these. NOTE Fresh trout can be cooked in the same way but sliced mushrooms can be used instead of apple because trout is less oily than mackerel.